Seasoned Vs Unseasoned Firewood - What's The Difference? Identifying seasoned vs unseasoned firewood can be difficult at times. To speed up the seasoning process a lot of people look for dead standing trees to process into firewood. Dead standing trees often have a reduced moisture content because the natural moisture produced by the tree does not exist. However, just because the tree appears dead it doesn't necessary mean it's ready for immediate use. Plus, these dead or decaying trees are often very dangerous to cut. Their branches are sometimes brittle and the trees can be unpredictable. "We live in the woods and have many trees that appear to be nearly dead, or dying. I've been taking some of them down. Should I allow a partially alive tree to season for a year, or can it still be used this winter? In particular there are a lot of overgrown cherry trees that show only partial growth on them, and others that are still standing and no growth." Although each tree is different, as a general rule a dead standing tree that has been dead for several years will have some wood that's ready for immediate use or within a few months of processing it. A good dead standing tree will have the bark pealing off and will be noticeably dead. When you cut down a dead standing tree be careful because the tops are often weak and the branches can break off and fall in any direction making it really dangerous at times. Once you successfully fell a dead standing tree, generally the top portion of the tree will be the driest. I usually find the bottom 6-8 feet of the trunk is the wettest and will need a while to dry out before it's ready to burn. This moisture is usually not from the tree, but the trunk soaks up moisture from the ground which leaves it too wet to burn immediately. The cherry trees on your property that still have some green shoots on them will probably need roughly 6 month to 1 year to season depending on how alive they really are. Since each tree is different it's pretty tough to tell just how dry the wood is until you cut it up. The top of the tree should be the driest. Firewood seasons quicker in the summer when you have the heat of the sun and the warm winds to help dry out the wood. If you cut down a cherry tree with green growth in the fall, especially a wet cool Michigan fall, it's not going to be ready to burn until next season. 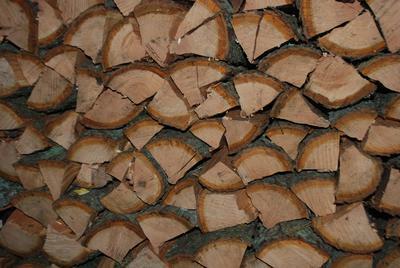 As with any firewood type, splitting the wood will allow it to dry faster. By looking at the firewood in your picture I don't see any cracks forming on the ends of the wood which means it probably needs a little longer to season before use. Plus, the color is still pretty bright and doesn't show that faded grey color of seasoned firewood. Sometimes cherry can retain its moisture for quite a while. I've had 8 foot bolts of cherry sitting in a pile for months only to find they're still really wet towards the middle when I cut them up. Sometimes seasoned vs unseasoned firewood can be difficult to identify. The exterior of the wood may appear dry but the wood is actually still wet. If you ever have any concerns about the moisture content of your firewood you can always invest $25-$50 in a firewood moisture meter. This handy tool will tell you the moisture content of the firewood so you know when it's safe to burn.